Day three (of twelve) – Icyhot! 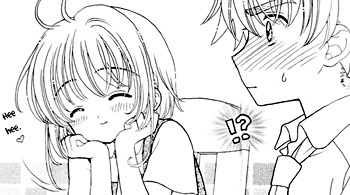 The quality of a CCS doujin is reflected by the amount of blushing contained therein… right? Going into this post, ignore two points. First, ignore that I am not Reb. Second, ignore that this is the second CCS doujin in a row. Come on, you love it anyway, don’t you? That’s what I thought! Has anyone ever noticed it’s usually Sakura doing all the talking in these doujins? Anyway, more Patisserie, with scans (again, I believe) by Tinuleaf @ Livejournal. In this story… Syaoran is worried. THE END! Day two (of twelve! )- FLUFF. 4 Comments on "Day three (of twelve) – Icyhot!" yeah yeahhhh yeahhhh! we love it !! thank you soooo much again for this new release !!!! thankss for the hard work !!! thanks for the hard work and the new releases!